This setup guide covers the basics of setting up your account to process recurring payments with PayWhirl. Welcome to PayWhirl, this quick start guide is intended to take you through the basics of getting set up to process payments online. Embed widgets in your website. Test with the PayWhirl Test Gateway. 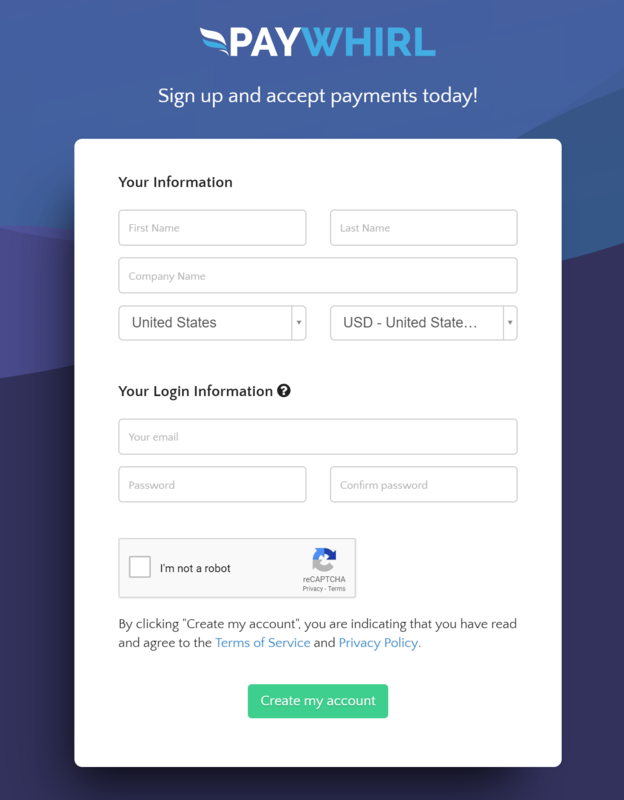 Connect your live payment gateway, launch! After completing the tour, you will see the basic setup checklist in the top left corner of your account dashboard. NOTE: For testing purposes, there are four demo plans and a tutorial widget already configured in your account. 2) Now you're ready to create a payment plan. Charge once - A plan with a single installment works as a one time payment. On a recurring schedule - Customize the frequency of billing (daily, weekly, monthly or yearly). Bill on specific days - Select specific billing dates for a payment plan by selecting the dates on a calendar. 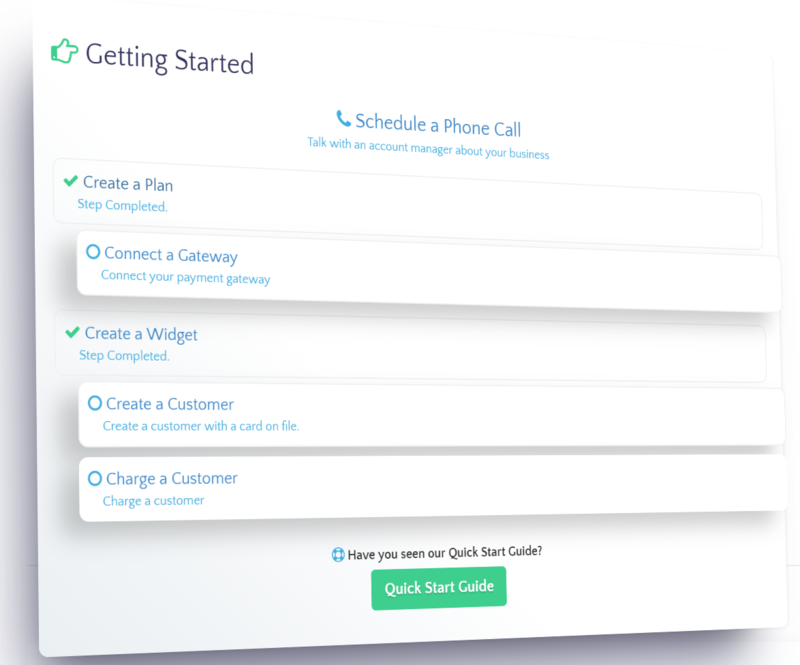 Custom billing schedules - Create completely custom billing schedules by combining multiple plans together in a chain. Pre-Paid subscriptions - Customers pay upfront for a specific number of installments, however orders are generated on a different schedule. For example, a 3 month prepaid plan that generates orders monthly. Payment Plan Example: One pound of coffee delivered every other week. In this example above, we set up the PayWhirl plan to bill customers $19.99 automatically, for a pound of coffee, delivered every two weeks. Most of the other settings were left on their default settings; however, you can customize them as needed. 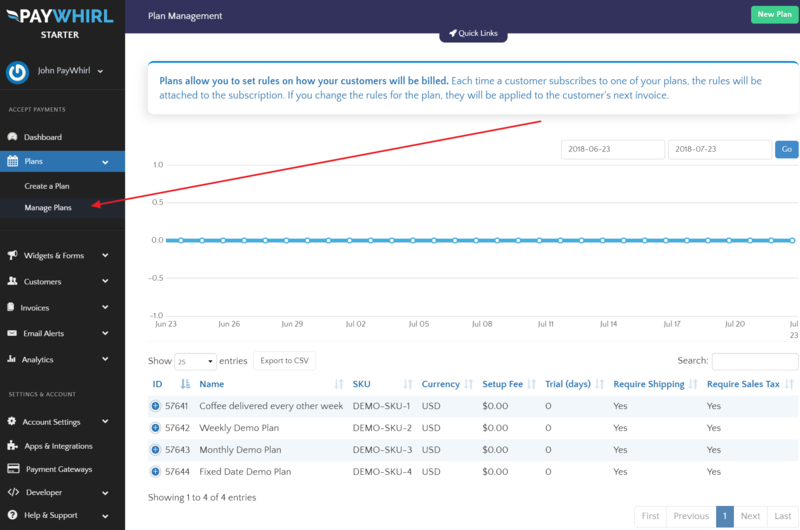 An example of one common change (for plans that bill monthly) is to set a specific "billing cycle start date" for the month, so customers who subscribe to the plan will all START their subscriptions on the same day of the month, and therefore re-bill relative to that start date. Another frequent change is to add a "setup fee" to the first purchase or to set a specific number of installments, so the customer's subscription to the plan ends automatically after a specific number of payments. When you have finished configuring your plan settings, click the green "Save Plan" button in the bottom right corner of the page. Then click "All Plans" in the top right corner to go back to the manage plans page. Next, repeat the process and create as many payment plans as needed to cover all your different billing scenarios. In this example, we added a second plan so we can provide a monthly coffee option for customers as well. 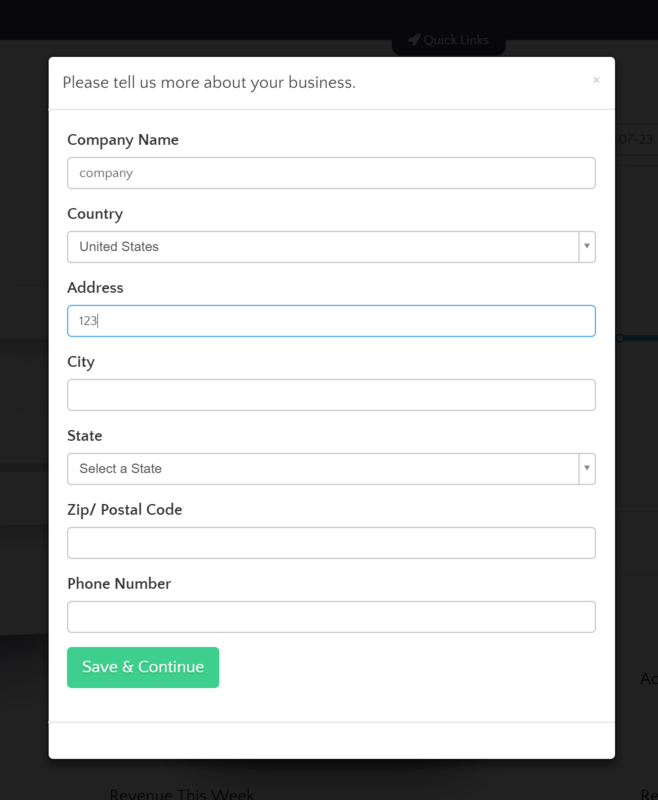 3) Create a payment widget to display your plan(s) to customers. 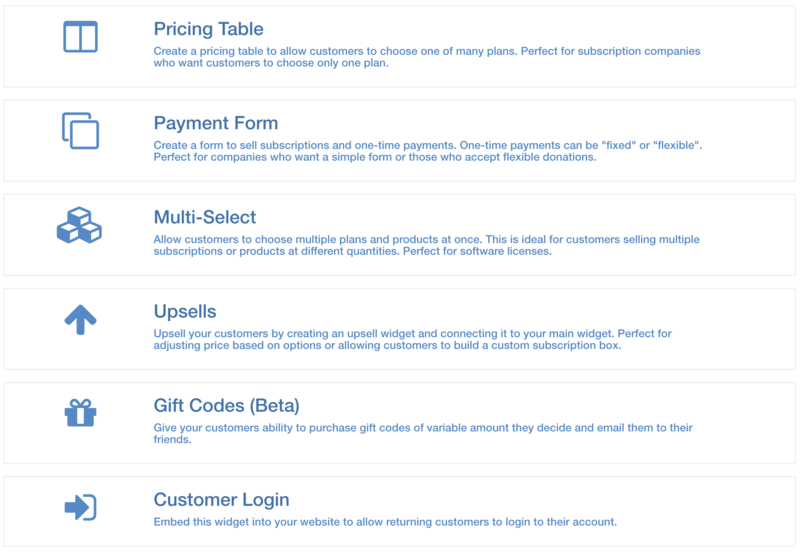 PayWhirl's embeddable payment widgets contain everything customers need to complete purchases from your website. Using widgets, customers can select their desired payment plan(s), create an account, answer profile questions, add payment methods and checkout securely on your website. By default, the "tutorial widget" in your account will be pre-loaded with demo plans for you to experiment. You can view or edit the tutorial widget to see an example of a checkout. It contains four pre-loaded demo plans and allows the customer to select between the different plans. 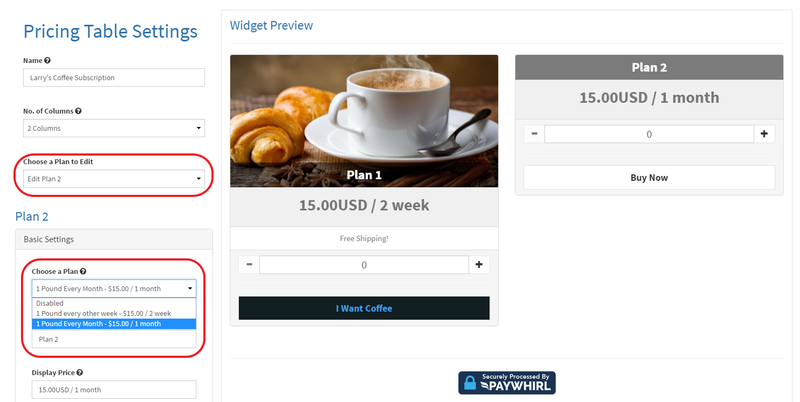 The tutorial widget also comes connected to the PayWhirl Test Gateway automatically so you can process test charges and see a preview of the checkout flow. To create a new payment widget, click on Widgets & Forms in the main menu and select "New Widget" button in the top right corner of the page. In our coffee example (continued below) we used a Pricing Table widget, but there are several different types of widgets to choose from depending on your needs. 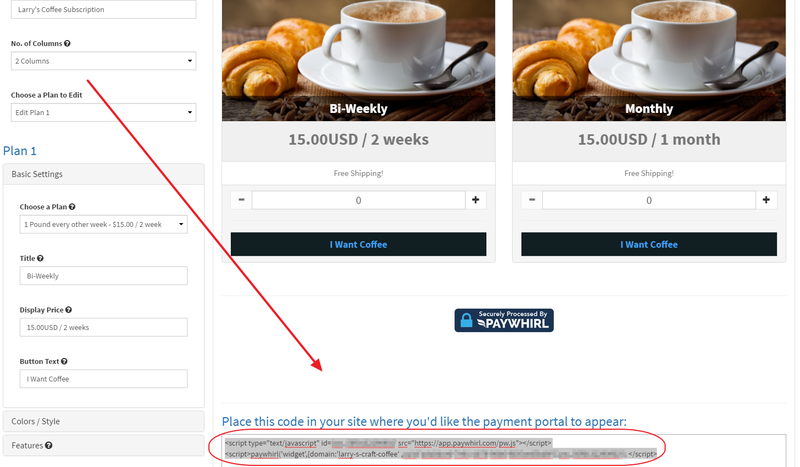 In addition to payment widgets, PayWhirl offers a customer login widget that allows you to embed a customer portal directly into a page on your website seamlessly. Many businesses embed the PayWhirl customer portal on a "member login" page so customers can access their accounts and make changes, as needed. However, the customer portal can also be linked to directly as it's hosted in the cloud. Within the portal, your customers can manage their account information, purchase additional subscriptions, change subscriptions, customize orders, change shipping addresses, add or remove payment methods, see future invoices, buy gifts for others, skip payments and more. You can also disable your customers' ability to cancel subscriptions or remove their payment methods on file, if required, from your advanced settings menu. 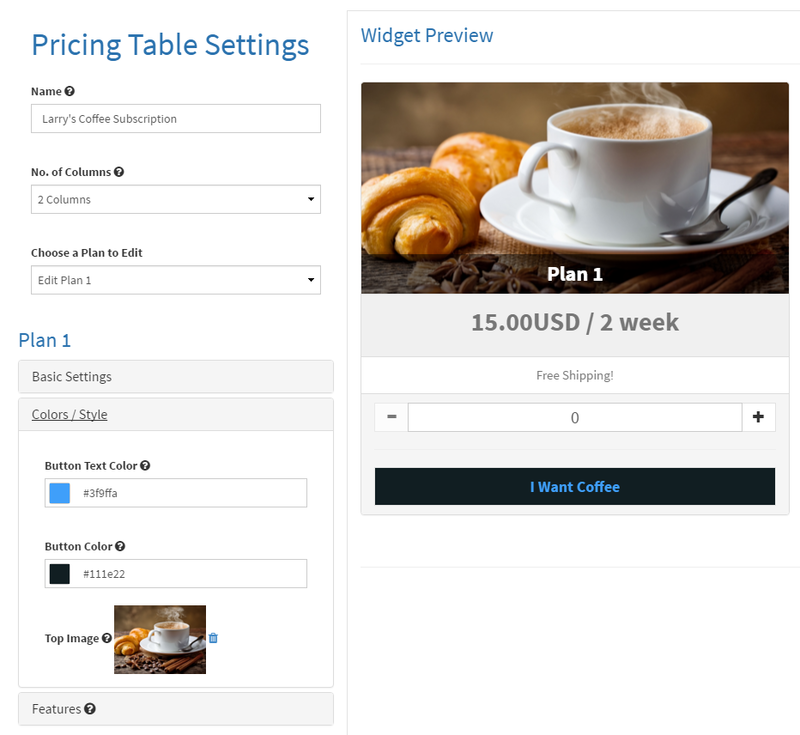 Continuing with our coffee example, we will configure our pricing table widget. We have two coffee plans to display to customers, so the number of columns in our widget should be set to 2 for the best results. This will ensure that each of our two plans takes up 50% of the widget's total width. On PayWhirl, each PLAN lives within a SECTION of a widget, and you can toggle between widget sections using the setting called, "Select a Section to Edit." Once you have selected a section of the widget, you will be able to edit the settings for that specific section of the widget. NOTE: New sections in a widget are disabled by default to prevent unfinished edits from appearing live on already published widgets, so you'll notice the widget preview starts off blank. In Section 1 - Under "Choose a Plan" select, "1 pound every other week" plan. After you've selected a PLAN inside the first SECTION of your widget, you will see your widget preview on the right side of the page. Under the Basic Settings panel for each section, you can customize how your payment plan information will be displayed to customers. For example, you can override the price display, add an image, define button colors, etc. You can also add optional "features" that will display to customers below the pricing information. In our example, we highlighted a feature called "Free Shipping!" to help increase conversion. We also changed the default button text to read "I Want Coffee" to give the widget a more personalized feel. Please note, you can customize all of the text within PayWhirl. The text is typically edited from the widget settings page or the translation menu in your account. You might have noticed there is no save button anywhere on the widget configuration page!? This is because widget changes save AUTOMATICALLY after each change on this page. In Section 2 - Under "Choose a Plan" select, "1 pound every month" plan. In the second section of our widget, we've configured the settings similar to the first, and we've also used the same picture/features as well. If you'd like to add an additional section(s) to your widget select "add a new section" from the "choose a plan to edit" dropdown and configure the settings as needed. Once your widget is customized, it can be embedded in any page on your website. Widgets are how customers will select payment plans and make purchases through your site securely. Just copy one of the embed codes from the bottom of your widget settings page and paste it into the HTML of any webpage (or product page) on your website. Please note, you can make changes in the widget editor later, and the changes will automatically reflect in your installed widget, without the need to reinstall. In our example install below, we used Shopify to embed our widget, but most website builders and platforms will work similarly. You just need to enable the HTML or "code view" of your page editor before you paste in your PayWhirl embed code. NOTE: WE WILL NOT EFFECT YOUR EXISTING CART OR CHECKOUT PROCESS!!! 5) Testing with the PayWhirl Test Gateway - VERY IMPORTANT!!! Now it's time to test a checkout using the PayWhirl test gateway to make sure everything works as we'd expect. WE HIGHLY RECOMMEND TESTING WITH THE PAYWHIRL TEST GATEWAY BEFORE CONNECTING A LIVE PAYMENT GATEWAY! Once you are satisfied with the customer experience, you can connect a LIVE merchant processor and payment gateway to our account. Stripe is available on all PayWhirl plans, and we offer several other gateways if you upgrade to any of our paid monthly plans. 6) Connect a live gateway to PayWhirl and LAUNCH!!! From the main menu in your account, click on Payment Gateways. Your customer portal registration and widgets are ALL configured to use the PayWhirl Test Gateway by default. YOU NEED TO TOGGLE THE GATEWAY SETTING IN EACH WIDGET AFTER IT'S CONNECTED. Lastly, don't forget to connect your CUSTOMER PORTAL REGISTRATION to use your live gateway after it's connected. Note: For security reasons, you also need to connect a live payment gateway if you want to add more than 10 TEST CUSTOMERS to your account. Adding a live gateway will remove this limitation. CUSTOMER PAYMENT METHODS WILL NEVER BE SAVED ON THE PAYWHIRL TEST GATEWAY. TEST CUSTOMERS CANNOT BE CONVERTED TO LIVE CUSTOMERS ONCE THEY ARE SAVED AS TEST CUSTOMERS. PLEASE MAKE SURE YOU CONNECT YOUR WIDGET(S) & CUSTOMER PORTAL TO A LIVE PAYMENT GATEWAY. Once you are finished testing and have connected a LIVE gateway to your account, you can select the new gateway from your WIDGET & PORTAL SETTINGS. Navigate back to the "Widgets & Forms" main menu item and click edit on the specific widget you'd like to connect to your live gateway. At the very bottom of the edit widget page click on "Advanced Settings" to reveal your payment gateway list. In this example, we're using Stripe as our LIVE payment gateway. That's it! We were able to setup a couple of plans, build a widget and embed it into a page on our site. However, please note this is just one basic example of how PayWhirl can be used to process payments online. There are an almost infinite number of configuration options within PayWhirl so please let us know if you need any guidance figuring out the best structure for your business. What's next? Ready for more? You might want to customize your email settings and templates or connect with an existing integration. 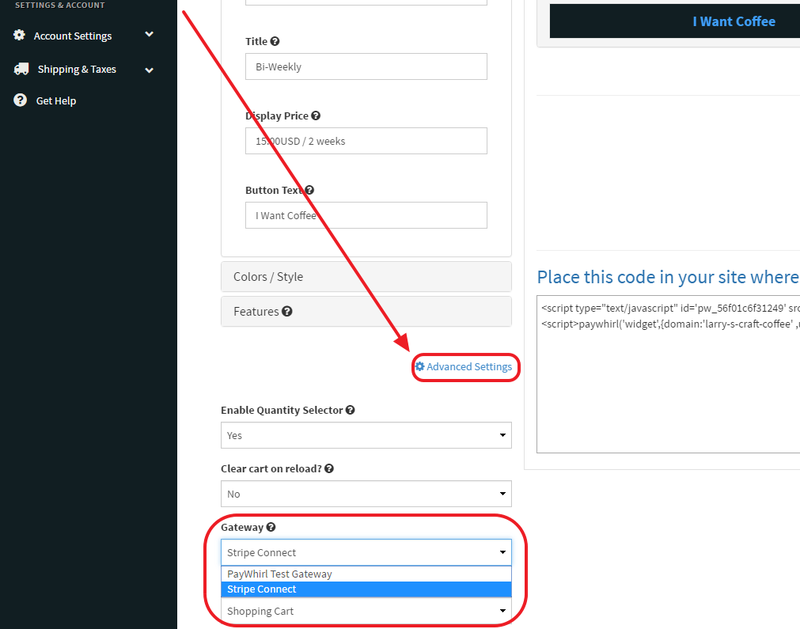 One of the most useful features of PayWhirl is our ability to create orders in connected systems like Shopify, BigCommerce or ShipStation. How does pricing work on PayWhirl? What payment processing gateways can I use with PayWhirl? Can I continue using the one time checkout cart already in my existing platform?